It is replaced by the Dymo LabelWriter 450 DUO. 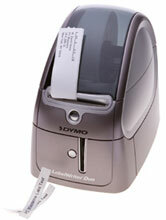 Direct thermal, label printer. 1 second per label, 55 labels per minute, USB. Includes printer, power supply, USB cable, Windows and Macintosh software and Users Guide on CD-ROM, printed Quick Start Guide, one roll of address labels, one DYMO D1 label cassette with black on white printing and one starter roll of DYMO Stamps.